Style:My Little Snugapuppy Deluxe Give your little one (and your arms!) a break with this super comfy baby bouncer. A deep seat with super soft fabrics, plush newborn insert and supportive head rest help keep little ones cozy as they bounce, play or soothe. A removable mobile with two adorable, hanging puppy and kitty toys and up to 20 minutes of music make playtime interactive and fun. When playtime is over, calming vibrations help soothe tiny ones as they snuggle into the extra comfy seat. Where development comes into play; Sensory: Sweet little puppy & kitty playing on the mobile up above captivate your baby and encourage eye tracking-helping to strengthen developing visual skills! 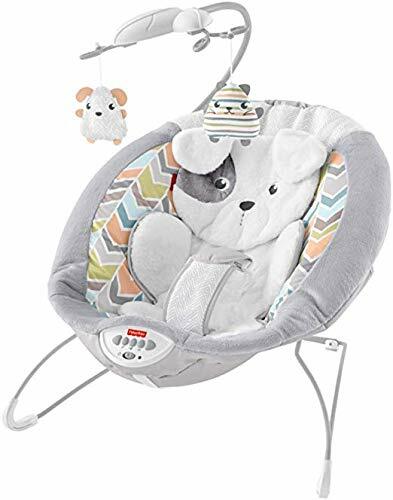 Security & Happiness: With an extra-cushy seat, plush fabrics, body insert & soft head support, along with calming vibrations, your baby will feel right at home here.